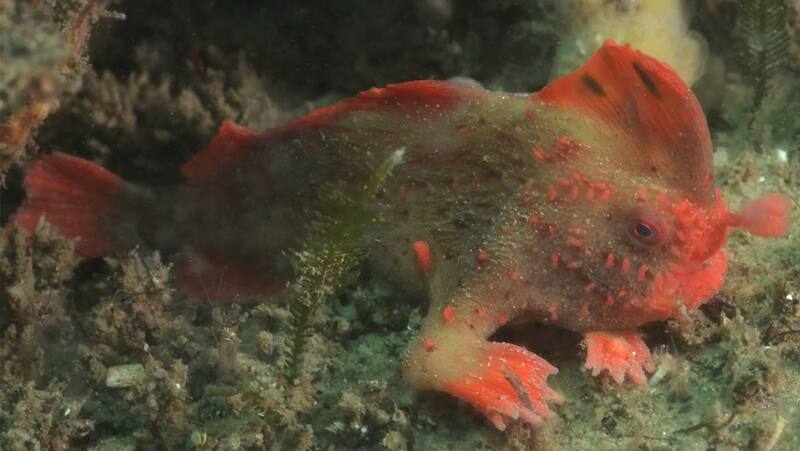 Nestled in the corner of a small reef just off the coast of Tasmania, a new population of critically endangered red handfish (Thymichthys politus) have been discovered, giving hope for the conservation of this species into the future. The population of this fish has now been given a big boost, thanks to eagle eyed members of the public involved in a citizen science project known as the Reef Life Survey. This elusive fish is found in waters around Tasmania, with the only known colony thought to be centred on a reef in Frederick Henry Bay, just off the coast of south-east Tasmania. After a member of the public taking part in the Reef Life Survey alerted scientists to the fact that they thought they had spotted a red handfish on a different reef a few kilometres away, leading scientists to carry out a more detailed survey of that zone, specifically focused on identifying red handfish. The team estimate that the new reef, the location of which has not been made public, is probably home to between 20 and 40 red handfish, effectively doubling the population of this species which is on the brink of extinction. The plan now is to consider the possibility of implementing a captive breeding program for the red handfish. Previously, this idea was always discounted due to the fact that the population was too small to cope with the removal of breeding pairs from the wild. Now that the population of red handfish is effectively though to have doubled, a captive breeding program could be a viable option in the fight to conserve this species into the future. Top image: New find of red handfish doubles estimated population to between 40-80. Photograph: Antonia Cooper/University of Tasmania.